bzimport set Reference to bz27911. While at it, also move it to Commons. [[mw:Manual:$wgAppleTouchIcon]], That is a seperate issue that you should file a seperate bug about. Making bug more general, there's much ugly stuff and/or inconsistant behaviour. Upload to Commons, (create/use seperate category and sysop-protect). If linking from commons, link everything from commons, not just a few. Upload/Rename to get consistent file-naming. Are there more cases like these ? Adding Roan to the CC list. I noticed the foundationwiki issue today after https was deployed there. I'm not sure if it's the reason that the page doesn't have a pretty green lock icon in Google Chrome, but it's probably not helping. have a pretty green lock icon in Google Chrome, but it's probably not helping. That was because of the logo, fixed that just now. Just the other day I read someone complaining about the (English) Wiktionary favicon being horrible due to low resolution on iPhone or something. Apple touch icons should be placed in the root directory with filename apple-touch-icon.png. The default size is 57px square for iPhone & iPod Touch, but some devices will benefit from up to 144px square. Since there is currently no easy way to serve different versions of the icons, make sure that those two icons are (1) 144 x 144 pixels so that iOS can scale them down and (2) they are small in size. Using pngcrush with the -brute option and reducing colour depth (in GIMP, that's Image --> Mode --> Indexed, with the number of colours set to 64 or a bit less) generally helps a lot. 's/those two//' => there should only be one icon; let iOS scale it down. A better goal would be to provide icons in all the standard sizes. There’s no reason to require 10 million readers’ mobile devices to download and resize too-large images, slightly compromising image sharpness, when we can simply resize them once. Nothing is gained by being lazy about this. 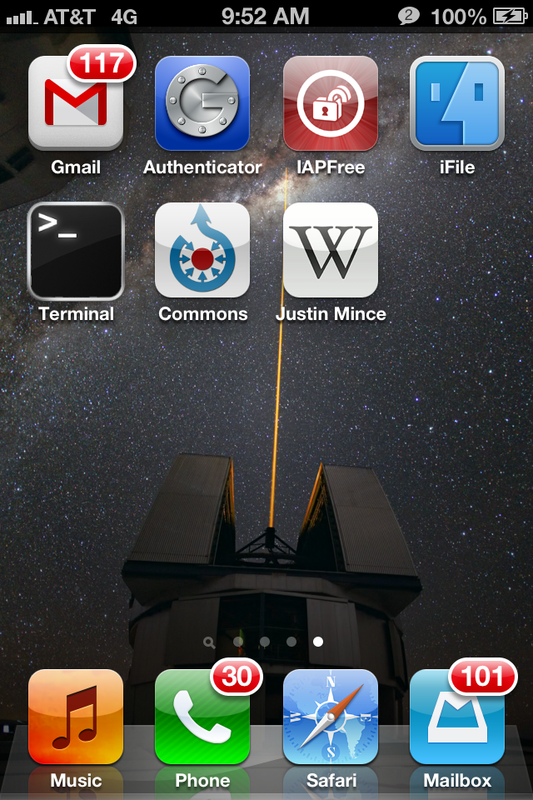 We're not talking about photographs in articles but the launch icon of a website shortcut saved to the home screen. The bandwidth isn't an issue on this small scale. Image sharpness is doubtful, I'd be open to some comparisons, but I think it doesn't matter whether we resize it and save that or have the device resize. Unless of course we're hand-crafting each version manually. That's where maintainability comes in. There's a whole bunch of these. If it does matter, we could have a apple-touch.php entry point like we do for favicon.php and have it serve a resized version (rewrite apple-touch.png and variations to apple-touch.php and it will serve a resized version based on the incoming file name). Here's an example screenshot of how the current Wikipedia Apple Touch icon looks like when scaled down from 144x144 pixels — that's what we currently provide — into a 114x114 pixels version on an iPhone with Retina display. The file, located at https://en.wikipedia.org/apple-touch-icon.png is just 5985 bytes in size, so I'd agree with Krinkle here that there's no need to worry about bandwidth issues. In terms of image sharpness, this particular example looks good to me.